(CNN) -- Steve Stricker took advantage of perfect conditions at Colonial to fire a second successive seven-under-par 63 on Friday, but it was only enough to claim a slender one-shot lead at the Crowne Plaza Invitational. 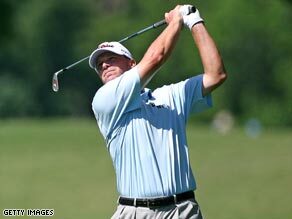 Steve Stricker is hoping that conditions at Colonial stay perfect for the rest of the weekend. The American beat the course's 36-hole record by two strokes to take the outright lead, having shared it with Tim Clark and Woody Austin on day one. South African Clark carded a 64 to lie second on 13-under 127, while that score was matched by both Vijay Singh (128) and Sean O'Hair (129). Jason Day carded a second successive 65 to be in fifth place, while Austin was a shot further back after a 68. American Ryan Palmer matched Stricker's 63 on his home course to climb to seventh place on 132, with a group of five players a shot behind him including England's Luke Donald (65). As an indication of how benign the conditions were, the cut was set at par 140 -- Davis Love, Trevor Immelman and Billy Mayfair were among those to miss out. "The weather, for two days in a row -- well, all week since we've been here -- has been unbelievable," Stricker told PGA Tour.com. "Wind is what this course needs to get difficult, but we haven't seen it yet. ... I kind of like what's going on right now. Clark added: "This course really rewards good play. It favors everyone." Former world No. 1 Singh is playing at the tournament for the first time since 2002, having withdrawn the following year due to the presence of women's star Annika Sorenstam in the field. "I'm really happy with the way I'm swinging the club," the veteran Fijian said. "I'm doing everything pretty good right now. That's a good feeling. "If you can hit the fairways, you can really attack the pin because you know they're going to stop." Veteran Australian Ian Baker-Finch also returned to the event for the first time since 2001, but missed the cut on an appearance marking his victory at Colonial 20 years. The 48-year-old will make a quick return to his television commentating duties after following up his encouraging 68 with a disastrous 78 which featured a double-bogey and six other dropped shots.